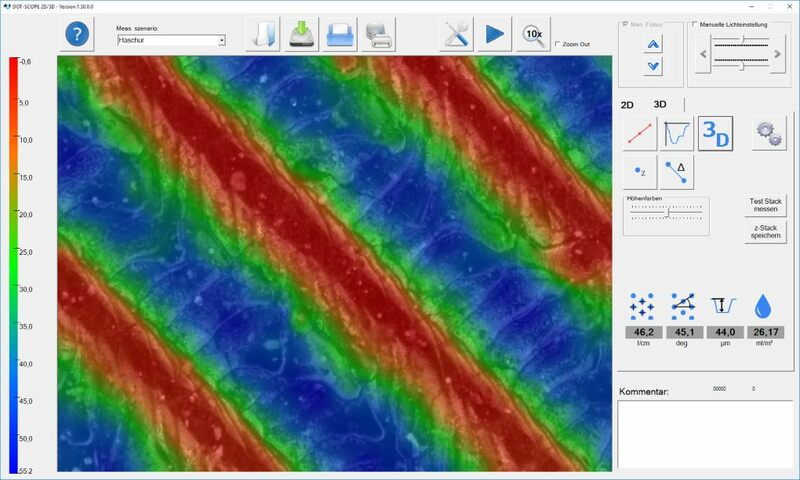 With the DotScope mini 3D you can easily generate 3D views and measurements of microscopic structures. The use is very simple: Bring the tool to the desired lateral position, move to the surface or top position and then click only on the measurement button. The microscope adjusts the lighting, taking images of different focal planes and the connected PC calculates from these image stack a 3D model. It will automatically detect the surface and align the 3D model to this surface. Also, the screen is thereby determined automatically. A typical measurement takes only 10 ... 20 seconds. The rapid image acquisition also decreases the influence of external vibrations on the measurement result. DotScope mini 3D, the small portable 3D microscope with the fantastic handling. The DotScope mini has an xy adjustment, which means that the details of a print form can be approached precisely. The nosepiece with three different lenses allows a quick search of individual dots in your print form. The 5x-lens provides the overview, the other lenses provide the accuracy in the measurement. The DotScope is compact and rugged and can be transported inclusive a notebook only with one hand to the measuring object. The DotScope software is clearly structured, showing a large video image and is intuitive to operate. The DotScope software displays a large video screen, making it easily recognizable even from a greater distance. The 2D functions of the 2D DotScopes are also available. Your partner for mobile microscopy and OEM projects. © Copyright 2018 by SOPRIN GmbH. All Rights Reserved.